Thanks to some new pools submitted by swimmers like you, Swimia.com is increasing in the daily quantity of stored pools. Please do not hesitate to make contact with us if you obtain any Qatar Swimming Pool with inaccurate or incomplete details. Please contact the sports center in Qatar to check which activities are being offered and their timetables, since Qatar Pools could have different rules and fares than other locations. Are you a regular swimmer? Have you ever practiced Aquagym in Qatar? Let us know!. Going to a Qatar Swimming Pool is escalating specially within the elderly population sectors of Qatar, who have suffered some type of muscle or bone damage. 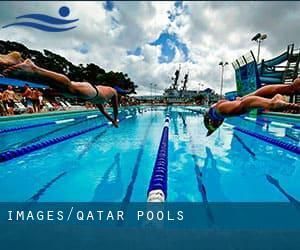 Most on the Qatar Pools offer both open lanes for independent swimming and also guided activities like water aerobics or Aquabike. Do you know of any Pools in Qatar that should be listed here? Contact us!. There are various causes why you should choose a heated swimming pool in Qatar. Probably the most necessary one relies on the importance of keeping the body temperature stable. If the water is too cold, your body will try to warm it up and you will lose strength to swim properly. Enjoy the best indoor pools in Qatar and don't worry about the weather. These facilities are open all seasons and you can enjoy a swim at the same temperature every day of the year. One of the advantages of outdoor swimming in Qatar is the possibility to sunbathe throughout the summer season. Taking it with extra care, sunbathing is wholesome due to the fact introduces Vitamin D into the body, so the perfect option seems to be switching amongst indoor and outdoor pools based on the season. It's difficult to visit Qatar without dropping by Ar Rayyan (with 272.465 residents). At present Swimia is showing you all the Swimming Pool in Ar Rayyan and the closest pools located in its vicinity. Holding an estimated population of 26.436, Al Wakrah is one of the most important cities in Qatar. Check all the Swimming Pool in Al Wakrah and its surrounding region. Swimming is often a wonderful thought to keep your body active during your visit to Umm Şalāl Muḩammad (Qatar), or perhaps for anyone who is a local. Swimia assists you to discover your closest Swimming Pool in Umm Şalāl Muḩammad. Let us let you know a secret to switch off while you are in Doha: just decide on a Swimming Pool in Doha and plunge into the water! There's no additional productive method. Ras Abu Aboud Street , Doha (Postal Code: 02977). Swimmers like you reported ~38 meters x ~40 meters, 3 lanes, Outdoors. Unfortunately we do not have the email address of this Swimming Pool, but we can provide you with the phone number. Ras Abu Aboud Street , Doha (Postal Code: 02977). Swimmers like you reported 25 meters, 4 lanes, Outdoors. Unfortunately we do not have the email address of this Swimming Pool, but we can give you the phone number. Next to Khalifa Olympic Stadium , Doha . Few days ago a common user of this center told us they offer Olympic size x 25 meters, 10 lanes, 2 meters depth, 2 meters depth, Indoors. Furthermore, they keep in good conditions 25 meters x 12 meters, 5 meters depth diving well, 5 meters depth diving well, Indoors. For this Swimming Pool, only phone number is number here. Updated on 2019 West Bay , Doha . This sports center provides 25 meters, Indoors. For this Swimming Pool, only phone number is number here.